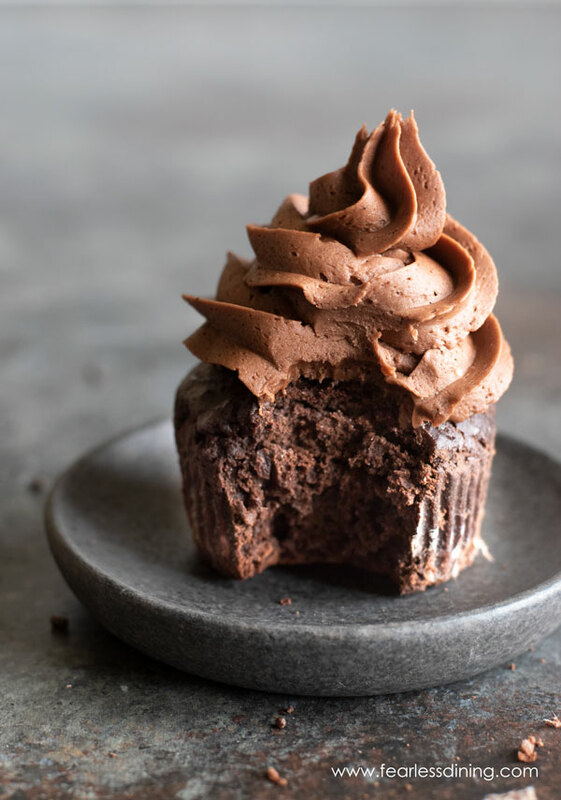 These gluten free chocolate cupcakes are so chocolaty, so good. I had to redo this post. You wouldn’t have found it otherwise…it was disguised as a party post! 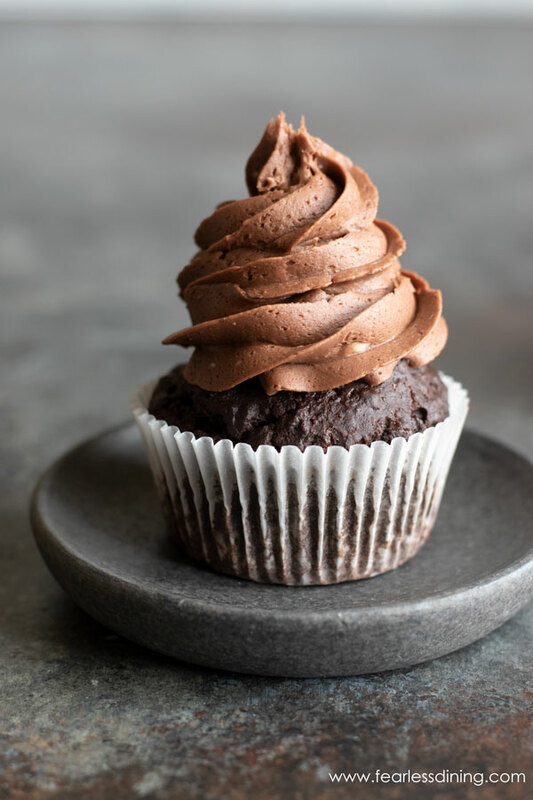 If you love chocolate, this easy gluten free chocolate cupcake recipe is for you. 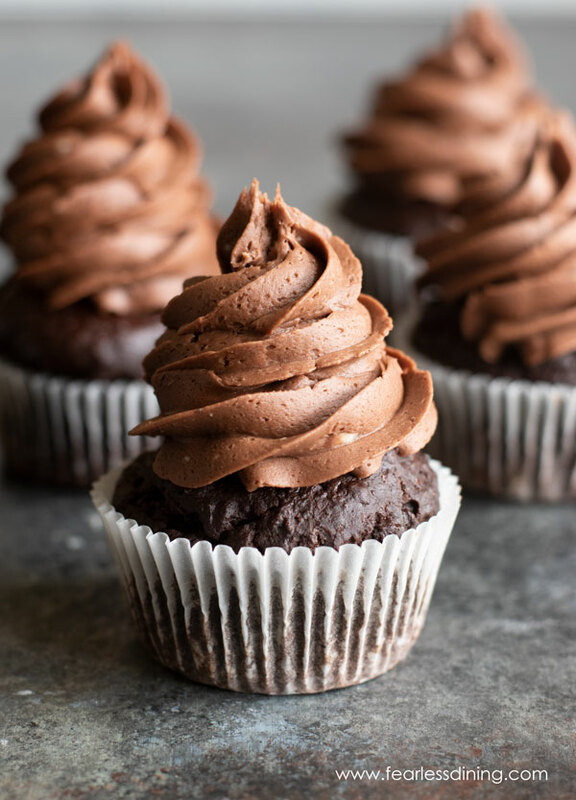 These cupcakes are moist, chocolaty, and just plain irresistible! 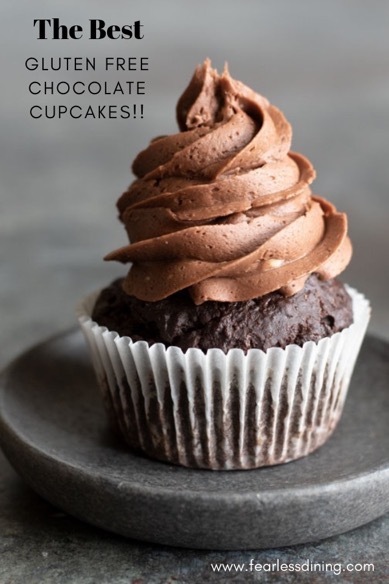 For the best cupcake recipes, check out my Gluten Free Cupcakes resource guide!! Our family loves to spend time together in the kitchen, and if you recall my delicious Gluten Free Vanilla Cake recipe, my daughter has been “hired” to make my gluten free desserts look beautiful! She is a big fan of the British Baking show and has all sorts of fun decorating ideas. 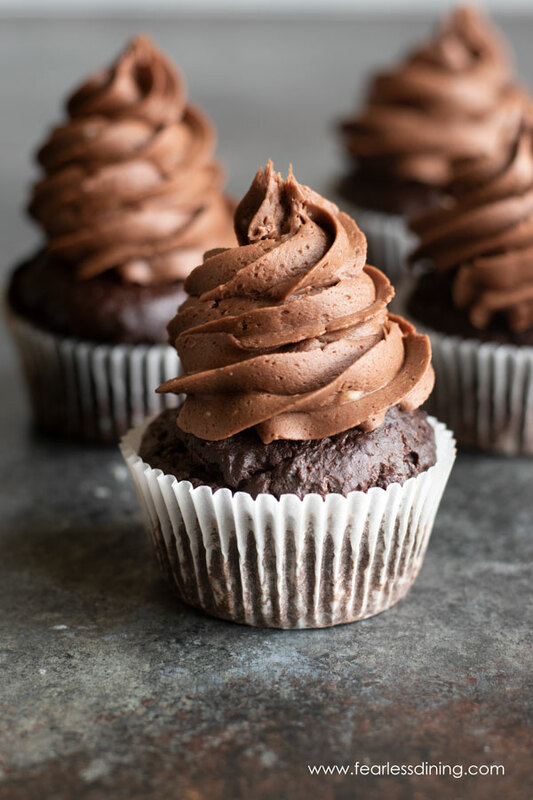 This easy gluten free chocolate cupcake recipe is really easy to make. 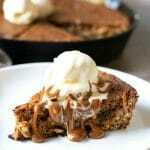 Grab your kids and head to the kitchen :-). 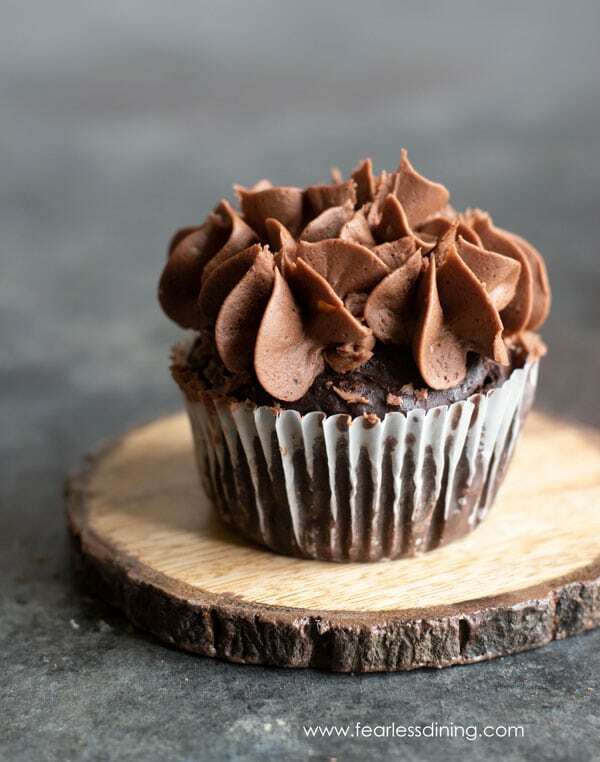 Another reason I wanted to update this chocolate cupcake post is that they are drool-worthy and they are perfect for many events besides holidays. School Parties – Teachers and kids will go crazy for the sweet goodness of these gluten free cupcakes. Bridal Showers – Nothing like having an amazing bridal shower and serving these stunning cupcakes to the guests. Community events – These gluten free cupcakes will shock people when they find out they don’t have gluten. Plus, they look so elegant! You can also make these cupcakes into a cute Cupcake Bouquet! 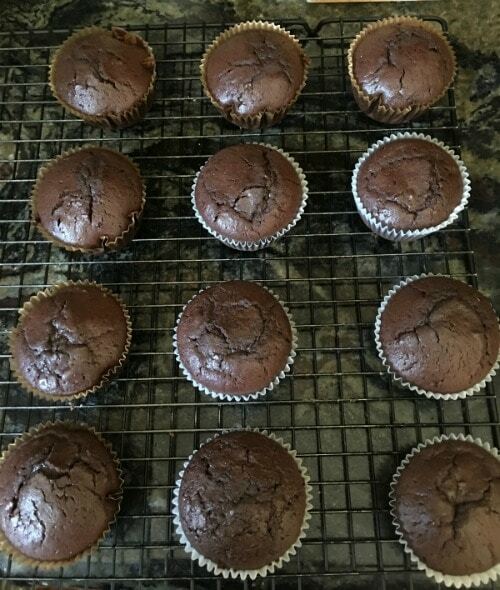 Are you ready to see how easy these gluten free chocolate cupcakes are to make? The first step to make this chocolate cupcake recipe is to add your dry ingredients to a bowl. Whisk to blend. In a separate bowl, add the wet ingredients and whisk to mix. Pour the wet ingredients into the dry ingredients and mix until barely mixed. Overmixing can cause these cupcakes to be denser. 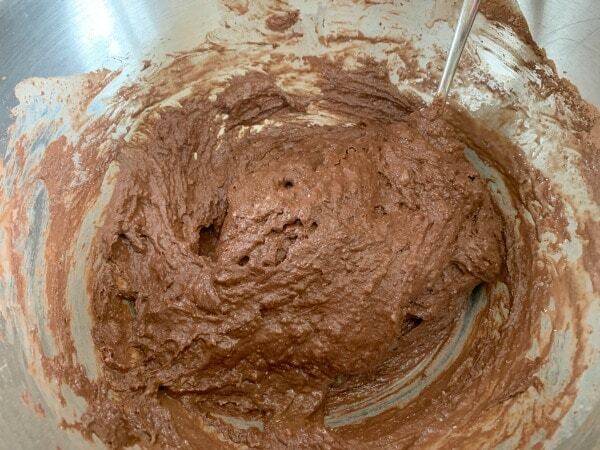 This is what your chocolate cupcake batter consistency will look like. Scoop your cupcake batter into lined muffin tin cups. How long do these gluten free cupcakes bake for? The gluten free chocolate cupcakes will bake and be very moist. 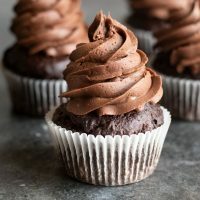 You can use frosting tips to decorate these gluten free chocolate cupcakes in so many different ways. Have fun and experiment to see what looks best to you! Why not add a fun color to your frosting. Some people are not into chocolate frosting on a chocolate cupcake. If this is you, feel free to make this easy Cream Cheese Frosting recipe (scroll down the cake recipe to the frosting recipe!) and have some fun with color! 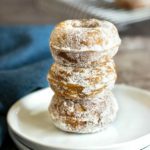 If you would like to add a little protein to balance out the sugar, substitute 1/2 cup almond flour and reduce the gluten-free flour blend to 1 cup. Add white or dark chocolate chips to the cupcake batter. If it isn’t Halloween, feel free to skip the gruesome decor. Raspberries – Add a fresh, ripe raspberry to the very top of the cupcake. It will look stunning! 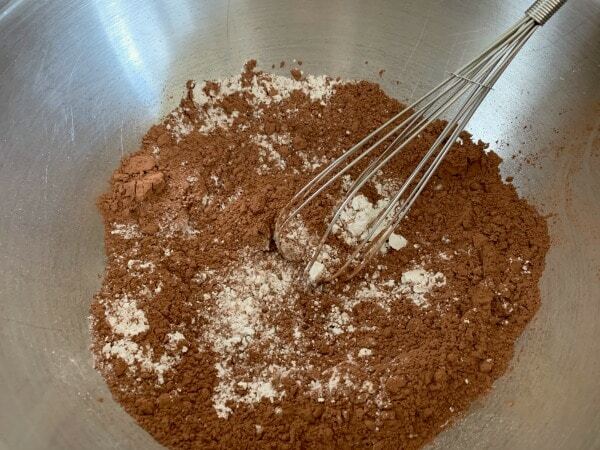 Chocolate shavings – You can use dark, milk or white chocolate to sprinkle over the top of the cupcake. These cupcakes are very sweet, so don’t go crazy. Sprinkles – You can never go wrong with a few sprinkles. Strawberry – Adding a strawberry is perfect to give the cupcake a romantic look! How Should I Store Gluten Free Cupcakes? There are a few options to store the gluten free cupcakes. First, you can store them frosted or unfrosted in an airtight container on your counter. If for some reason you do not have an airtight container, you can wrap them with plastic wrap. Make sure to use several sheets of plastic wrap to ensure that air doesn’t get to the cupcakes. Due to the dairy in the frosting, you should store the leftover frosting in the fridge. Additionally, if you have frosted all the cupcakes, store them in the refrigerator as well. No matter where you store the cupcakes, make sure they cool completely before putting them away. Otherwise, you will get condensation built up in the container, and it will affect the texture of the cupcake. Can I Freeze These Gluten Free Cupcakes? Yes, you can freeze cupcakes for 2-3 months. Make sure they have, and you store them in an airtight container. Do not frost them until you are ready to eat them. When you are prepared to use them, defrost on the counter and frost as needed. Freezing them ahead of time makes your life even easier if you are planning a big birthday party, bridal shower or community event. 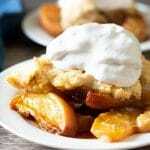 You can make large batches and freeze them the day you need to serve them. 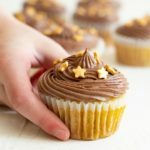 How To Make Perfect Chocolate Cupcakes Every Time? Here are a few tips to help you make sure that your cupcakes are tasty and moist every time. Don’t stir the batter too much. Often people think that they need to keep mixing it and that adds additional air to the mix. This creates a less than stellar cupcake. Use quality ingredients. I know that food can get expensive, but when it comes to baking, you should spend the extra money on quality ingredients. 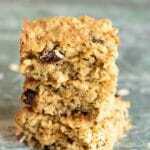 Room temperature ingredients – If the ingredients are too cold it can affect how they bake. Allow butter and other cold ingredients to sit at room temperature before mixing. Use a large cookie scoop to put the batter in the cupcake tin. Then you will have gorgeous uniform cupcakes. Don’t overbake or bake at too high of a temperature. Double check your oven temperature and check the cupcakes often to ensure you don’t over bake. Otherwise, they will turn out dry and not as flavorful. A muffin pan to make the cupcakes in. 4 tablespoons milk, (*I added more to get the thickness I wanted 1 TB at a time. 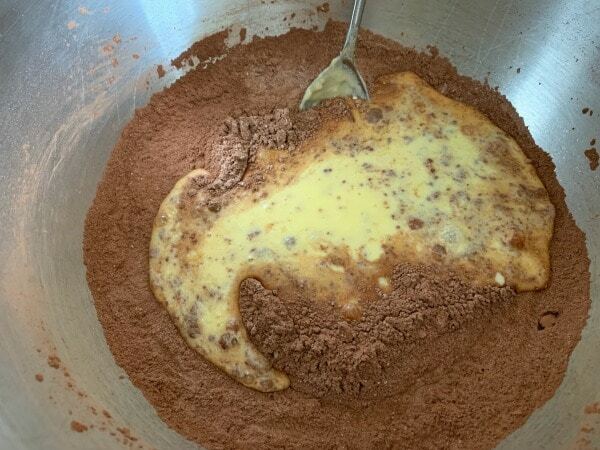 In a mixing bowl, add all wet ingredients (up to the butter) and mix on medium speed. Gradually add in the dry ingredients, turning the mixer to low to add these. Once they are blended, increase the speed to medium. Add paper cupcake liners to a muffin tin. Fill each 3/4 full of the batter. Remove the cupcakes from the oven. Take the cupcakes out of the tin and put onto a cooling rack to cool off. In a mixer, add powdered sugar. Add powdered sugar, food coloring of choice, and milk. Mix on low. Add more milk gradually until you get the consistency you want for your monster frosting. These look so good! Chocolate frosting and chocolate cake is my favorite! Great recipe Sandi! The Halloween cupcakes are just the cutest (in a scary kinda way)! 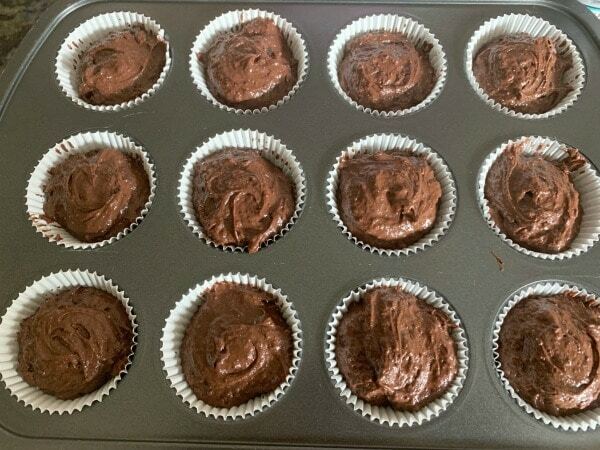 Thanks for resharing your recipe – can never have enough chocolate! LOL, my kids had fun, this was the first year they were okay with scary. Goodness those chocolate cupcakes look divine! I could inhale the whole lot of them! These look spectacular, Sandi! The perfect party cupcake! We made these cupcakes last night and they were delicious! Thanks for sharing! Awww, I am so glad you liked these Jessica. I am gluten free too and I always use bob’s red mill flour. It is the bomb. These cupcakes are gorgeous and I love that frosting piled high! I bet you can’t tell these are gluten free as they look super chocolaty and AMAZING! These are too fun!! These are perfect for any Halloween party! Oh my gosh, these are awesome! I love everything about them. Halloween is my favorite. Those little knives are awesome too! Super cute! I love Halloween themed desserts! Well, aren’t these adorable? I hope your husband takes the hints. Perfect party cupcakes, for sure! I think these are just about the most adorable Halloween cupcakes I have seen so far! So spooky and yet cute at the same time! These are adorable! I love ’em! Thank you Heather…so many have written that their husbands don’t do Halloween. I wonder why. These are so creepy AND cute! Doesn’t do Halloween? Oh no…he’s missing out on all the fun! I know…wish I could convince him! These are SO cute! They’d convince me to have a Halloween party!! !